Like many world travelers, I love to stare at maps. I’m drawn to distant areas with limited numbers of roads, and am especially intrigued by towns at the ends of such roads, picturing romance in remoteness. 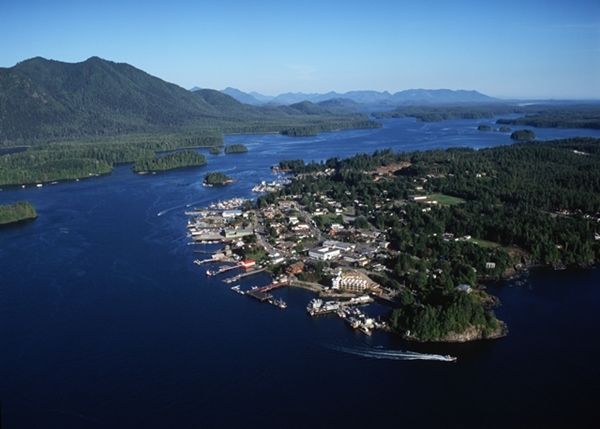 Since well before I moved to the Pacific Northwest in 1999, I’ve wanted to visit Tofino on Vancouver Island. Looking at my Rand McNally road atlas, I’d long noticed that it’s the northernmost town on the Pacific Coast of the island that’s reachable by a red line, meaning a principal highway. In fact, there don’t seem to be any other Pacific coastal towns to the north reachable by paved road; Winter Harbour at the upper end of the island is accessible by unpaved road, and it’s technically on Quatsino Sound, which leads in from the ocean. 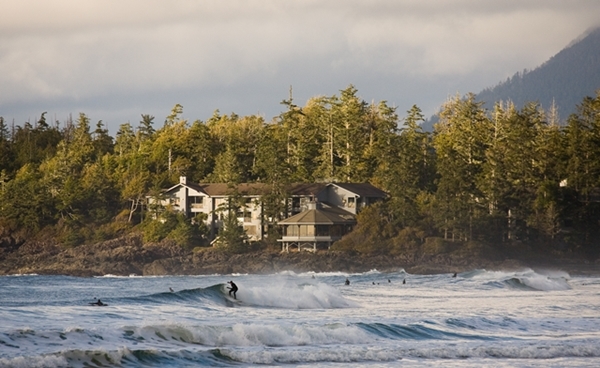 Being on the Pacific and bestowed with many fine beaches, Tofino is a town full of “surfer dudes” (the total population is about 2,000), so the lifestyle is rather laid-back. Still, if you don’t surf, there are many other sensual pleasures to enjoy, even (or should I say especially) during inclement weather. So join me as we go to the remote town of Tofino, where we stamp this week’s Passport to Pleasure—a hedonistic quest for great food and good times for two, from nibbles to naughtiness. It’s possible to fly directly into Tofino (from a Canadian city), but to get a full sense of the “end of the road” location, you’ll want to drive from Victoria. The Victoria Clipper is an easy way to make the trip from Seattle to Victoria with an enjoyable three-hour ride, but another option is Kenmore Air. Leaving from Lake Union, you get a spectacular view of Seattle upon takeoff, and then it’s a quick and scenic one-hour flight until your seaplane lands in Victoria’s inner harbor. It’s a fun and romantic way to start your trip, especially if you’ve never taken a plane that’s landed on water. From Kenmore Air’s terminal in Victoria, it’s a very easy walk to National Car Rental, where you can pick up a car for the drive to Tofino. There are interesting stops you can make along the way, particularly for food (including True Grain Bread/Hilary’s Cheese at Cowichan Bay, and the Nanaimo Bar trail in Nanaimo), but it’s hard to pass up the previously discussed Fol Epi for the most amazing albacore tuna sandwiches. If you can handle the temptation, hold off on eating those sandwiches until you reach Qualicum Beach (yes, it’s right near the source of those delicious scallops) where you can enjoy a picnic with a great view of the Strait of Georgia before crossing to the west coast of the island. You might also want to check out Coombs Old Country Market in Parksville if you want snacks or beverages for your ride, an interesting assortment of international foods to bring home, or a view of the goats on the store’s roof (really). You’re now ready to take Route 4 to cut across the island. In wintery weather, keep a watch of the BCHighway Cams website for road conditions, as there are two tricky passes to traverse. (If you’re feeling the despair of snowy travel, breathe deep and enjoy the stunning “powdered sugar” look of the trees and mountains.) By the first, Port Alberni Summit, it’s worth a stop at Cathedral Grove. 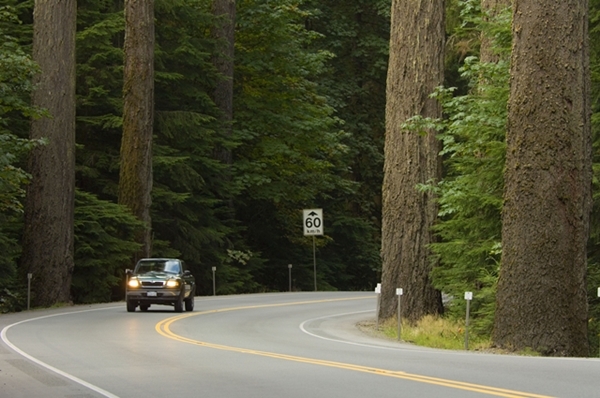 You can park for just a few minute to get a feel for the forest of towering Douglas fir trees, or if you have more time, take advantage of the network of hiking trails. The town of Port Alberni is a possible mid-island stop of civilization that’s actually a port, at the head of Alberni Inlet. From there, the road gets more challenging as you approach Sutton Pass. At the start of the descent, you’ll feel like you’re in a car commercial, demonstrating aerodynamic properties as you navigate the road while it winds, with steep grades, as if plotted by a child or drunkard before finally reaching the coast. (There’s an information center just before the intersection.) Left takes you to Ucluelet, but you’re turning right (and staying on Route 4) for the remainder of the drive north to Tofino. Time it right, and the oyster lover in you can enjoy the annual Clayoquot Oyster Festival. Why a festival? Clayoquot Sound is a coveted cultivar of the bivalve, annually growing over 50,000 gallons of oysters. (Festival-goers consume over 8,000!) While the festival offers numerous activities, you’ll certainly want to check out the colorful Mermaid’s Ball. This is one of many times during the year when the townspeople of Tofino let their hair down, dressing in costumes and dancing the night away. Refreshments include an abundance of oysters served raw or barbequed in the “oyster pit,” and there are competitions for the likes of best costume and best oyster slurper. The culmination of the festival is the Oyster Gala, in which many of the locals shed their crazy costumes in favor of something more elegant. Here you’ll enjoy beer and wine tasting, along with more raw and barbequed oysters. But the highlight is that selected local restaurants serve samplings of the honored oysters prepared in diverse ways. You can find indoor activities if you like, from touring the Tofino Brewing Company to taking in regional art at the Eagle Aerie Gallery. 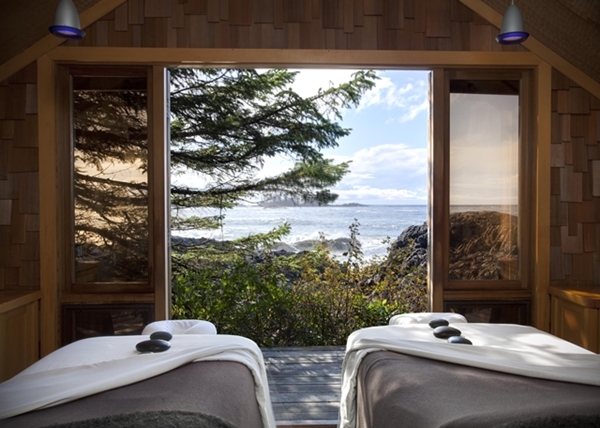 But in Tofino, you want to take advantage of the terrific outdoors. If you’re here for the Oyster Festival, Remote Passages puts on an educational oyster farm tour that will make you further appreciate what you’re eating. You’ll see the pristine waters of Lemmens Inlet, where lines of oysters (an eco-system unto themselves) are kept until it’s time to harvest. You’ll even get to sample the freshest oyster you can possibly imagine. The oyster farm tour is a special event help just one day per year, but Remote Passages offers numerous other trips as they try to preserve the ecological value and timeless wonder of the sound. You can do a whale watch trip to spot gray whales (and more), a full-day hot springs trip (which includes a soak, a walk in an ancient rainforest, and wildlife spotting), and bear watch trip. Remote Passages also assists with sea kayaking trips. As you might expect, there are fantastic hiking trails both in and out of Pacific Rim National Park. The Schooner Trail, one kilometer in each direction, is at the north end of Long Beach, and is especially good at low tide. (Knowledge of tides is important in Tofino!) Or try Combers Beach Trail, which winds through Sitka spruce forest and reaches a beach where you can see trees stunted by winds and the ocean’s salt. Choose just about any beach in the area and you’ll cherish views that are well worth the effort of traveling to Tofino. 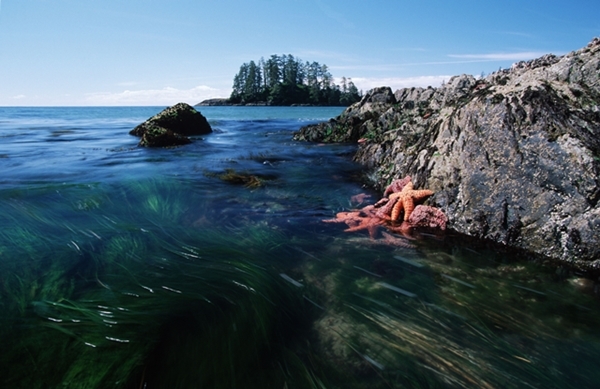 South of Tofino, in Ucluelet, you can take a walk on the wild side on the Wild Pacific Trail. The windy trails reveal spectacular scenery as you go through coastal temperate rainforest with take in views of Barkley Sound to the east and the Pacific Ocean to the west (and south). There’s a 2.6 kilometer loop that is easy and picturesque. Maybe the main reason to visit late fall or winter is storm watching. It sounds strange to travel so far for a weather experience you might dislike at home, but the powerful beauty of the sights and sounds of the wind and waves is captivating—whichever side of the window you’re on. 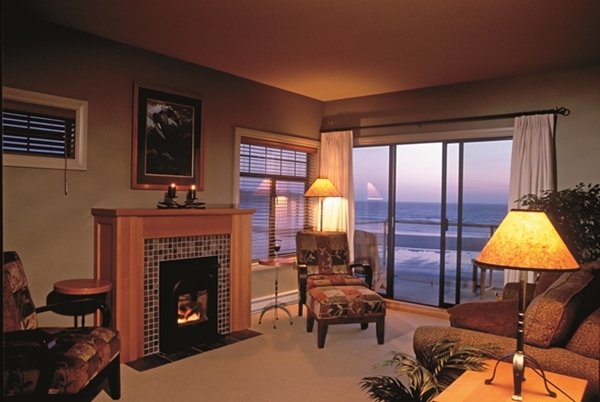 If you go bananas for beachfront views, Long Beach Lodge Resort is hard to beat. 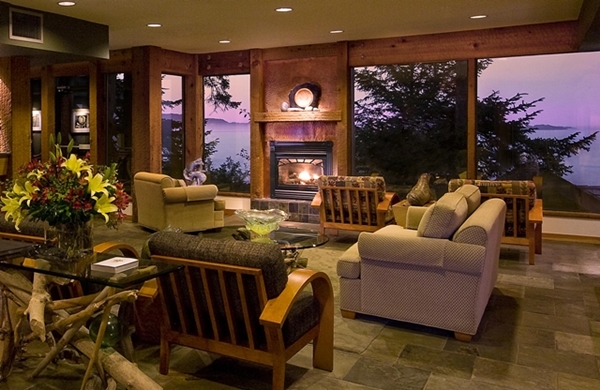 The lodge has 41 luxury rooms, most with ocean views. The staff is warm and friendly, and amenities include waterproof rain jackets to help insure you’ll talk advantage of beach walks right in your backyard. You’ll be tempted to explore the beach before or after breakfast, during the day, and especially in the evening to watch as the sun sets. If you’re cold or tired, take in the view from your soaker tub. Wake to a buffet breakfast (included in your rate, with other meals available at additional charge) in the scenic Great Room, where you can linger over coffee while watching the beach come to life. 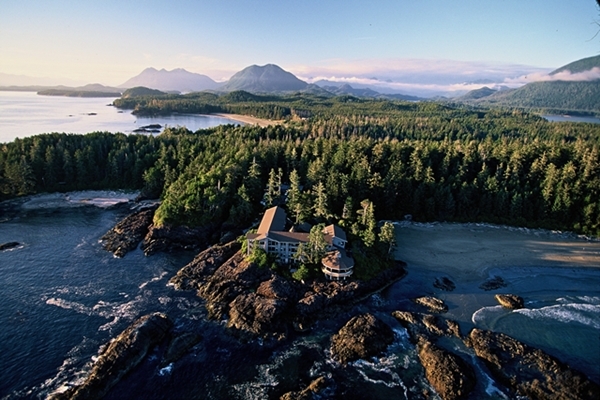 Just north of Long Beach is Chesterman Beach, which provides a dramatic setting for the spectacular Wickanninish Inn. 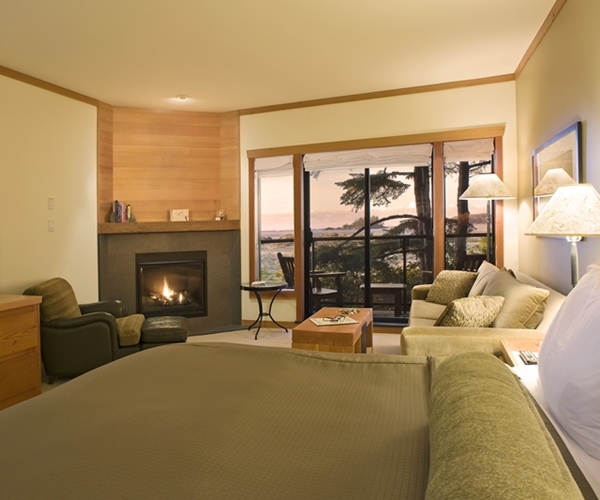 Each of the 75 guest rooms and suites boasts a fireplace, soaker tub, and balcony that offers ocean or beach views. The Wick, as it’s affectionately called, is a Relais & Châteaux property, coveting the “5 C’s”: charm, courtesy, character, cuisine, and calm. This is an elegant and yet unstuffy property, with lots to explore. The Lookout Library has historic artifacts, a DVD library, and dramatic Chesterman Beach views. 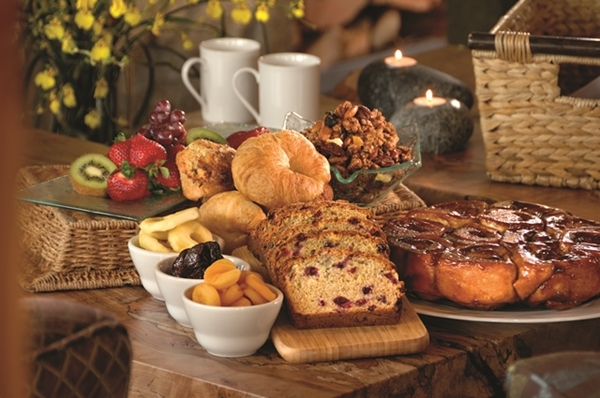 The Driftwood Lounge is a relaxing place for breakfast or a snack throughout the day. A fitness center will help you burn calories, though there are walks right outside, including a rainforest beach loop trail. 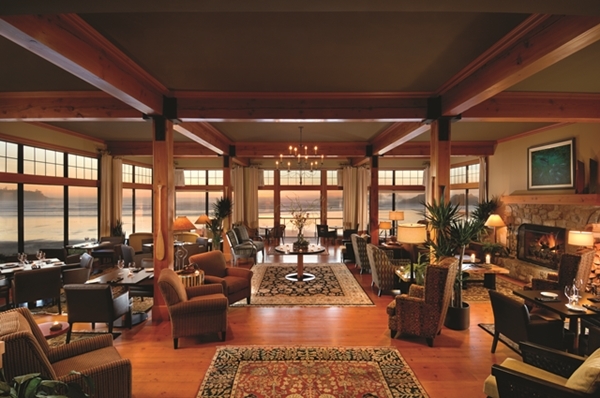 The Wick is home to the luxurious Ancient Cedars Spa. This is a full-service spa that offers extensive body and aesthetic treatments. You can indulge in a couples massage or more extensive package, perhaps in the “Rainforest Haven” or “Cedar Sanctuary.” There’s a relaxing eucalyptus steam room, and you’ll always remember sitting outside, even in the cold, wrapped in blankets with tea while enjoying a foot soak and forest/water view before your main treatment. When you return to your room after dinner, you’ll appreciate the turndown service and the sultry sounds of Diana Krall on your Bose system. 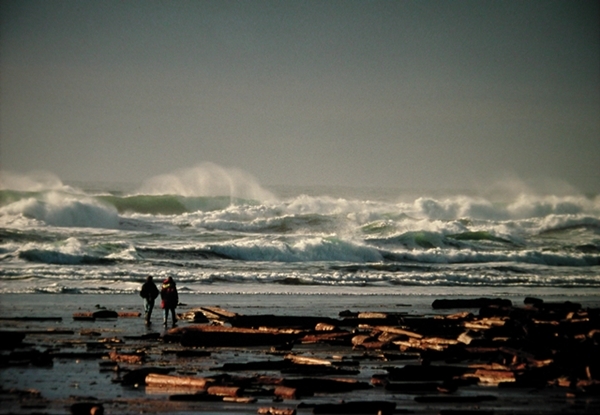 Do you throw on provided raingear and take a romantic walk on the beach to experience the pounding surf? Head to the double-soaker tub? Snuggle in front of the fireplace and picture window? You can do all three, perhaps in that order. 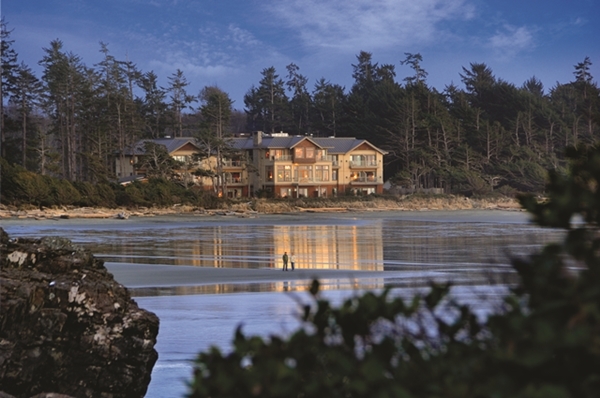 The Pointe Restaurant at the Wickaninnish Inn was built meticulously so that, anchored on the rocks overlooking Chesterman Beach, diners can appreciate a 240-degree view of the pounding Pacific surf. There’s even a speaker system (with microphones outside) that enables diners to feel like they’re outside, in the midst of a major storm. Some settings are forever memorable. This is one of them. The food is fabulous, too. The cuisine is built upon coastal seafood, the island’s farm-fresh ingredients, and a discriminating selection of Pacific Northwest Wines. At Spotted Bear Bistro, Vince Fraissange is at the helm behind the hand-milled, salvaged cedar bar that fronts the open kitchen. Fraissange, who worked previously at La Crocodile and Lumiere, and sailed the world as a private chef on yachts, is now grounded in Tofino taking advantage of seasonal and local ingredients. You’ll see this play out in his tasty take on pho, which includes pork and prawn patties, as well as smoked albacore tuna. 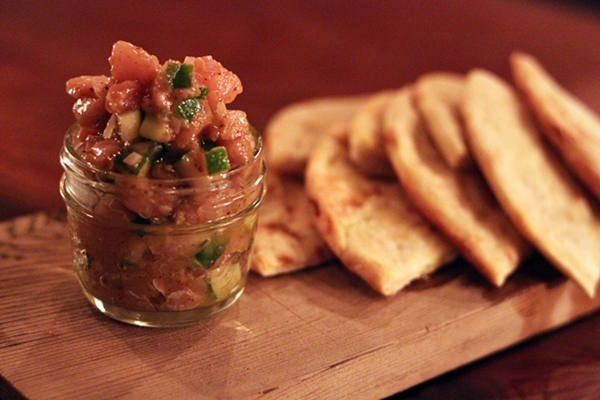 Albacore plays the starring role in a perfect balanced tartare spiked with soy truffle vinaigrette. This intimate, friendly bistro features a simple menu; look for one soup, one salad, a pizza and pasta, and some protein offerings, like pan-seared Fraser Valley duck breast in various preparations. Best bet is to turn control over to the kitchen in going with a four-course tasting menu for $60. There are many places to try fish and chips in Tofino. Some say Shelter does it best. SoBo stands for Sophisticated Bohemian. This food truck turned restaurant uses fresh, local ingredients to serve diverse dishes in a cheery environment. Speaking of food trucks, Tacofino is so popular that its operators applied for (and received) one of the coveted positions of new food trucks in Vancouver. The Tofino location still draws long lines for its delicious soup, tacos, burritos, and, of course, the sinfully delicious chocolate Diablo cookies, spiked with cayenne pepper. Clayoquot Sound photo (second from top), Alberni Highway photo, and Clayoquot intertidal fauna photo courtesy of Tourism Vancouver Island – ChrisCheadle.com. Long Beach Lodge Resort photos (suite, “Looking back at the lodge,” breakfast buffet, and Great Room) courtesy of Long Beach Lodge Resort, Tofino. Wickaninnish Inn photos (“spectacular setting,” “luxurious room,” spa, Chesterman Beach” courtesy of The Wickaninnish Inn, as are the “Lounge” photo (taken by Chris Pouget) and the “surfers” photo (taken by Wayne Barnes). Great write-up on one of my favorite places on Earth! For interested travelers I would also recommend the ocean-view sixplex suites at Middle Beach Lodge and a cod burger at Wildside Grill (better, IMHO than the one at Shelter). The hike along the boardwalk of the Rainforest Trail in Pacific Rim National Park is not to be missed. Thanks for the suggestions. I almost tried Wildside, but timing didn’t work out. Next time!